“Your integrity has led to healing and unity, which gives you vast potential, and this surge of energy brings with it the ability to prosper, a continual flow of energy to be invested. Being at one with who you are destined to be can also lead to the power to create good fortune for yourself. This abundance, which will come lovingly and safely, can result in a time where you take your place in the world. You are now at home with your sensitivity, your psychic abilities, and you are able to help the world simply through being yourself, who you are at your core, and using your beautiful, innate, intuitive talents. You are in tune with this new earth energy. We all have this capacity – regardless of age, religion, race, creed, family background, and our own issues, every human has the chance to change into a person with a higher purpose. When we live from that place, we are truly peaceful, content, and abundant. We are like children coming home when we move into this energy and embrace this planet, for the planet in her turn embraces us, and showers us with gifts. 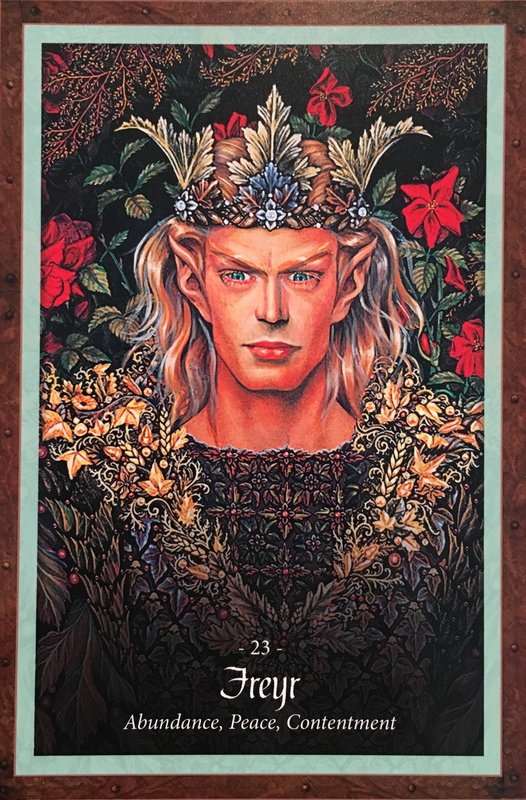 Here we are graced with the presence of the Elven King himself, the Freyr, with news of abundance, success, wealth, health and prosperity. How can it get any better than this? All that hard work really is paying off! You have found your place in the world. You may suddenly find that you have to offer, others have been looking for; a perfect match. It is your attitude that has helped you get this far, the trust, surrender and faith that the Universe will provide. And it is providing! Meet this amazing windfall with a heart full of peace, joy, gratitude, and fulfillment. Bask in the glory of perseverance; slow and steady action towards your dreams. This is co-creation in it’s finest form. You have mastered your intention, honed your focus and used the valuable gift of your imagination to visualize your dreams coming true, and here they are, coming to you in ways that you did not even dare to imagine. There is no limit what is possible during this amazing window of opportunity between yesterdays new moon in Aquarius and the Full moon coming up on the 19th. Use this divine energy and fill it with possibility. Do not leave any door unopened, any stone unturned. Embrace life in every possible aspect, with a smile on your face, a skip in your step; a kind word and a hug ever at the ready.